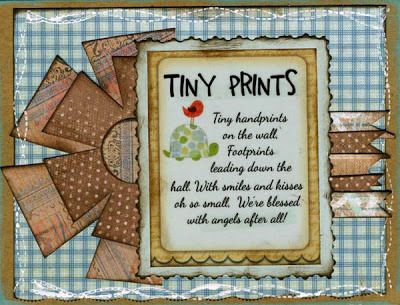 It's Lynn today and I am sharing a project I did using the Stowaway 6x6 Paper Pad and some of the Kiwi Lane Templates. This is my last project with Kiwi Lane, but I'm going to be using those templates again I'm sure on a few projects! I decided to make a card for a girlfriend who just had a baby. I thought the Quote from the Family Bundle was just perfect for the card. I used the Kiwi Lane Templates and cut some chevron strips from the 6x6 paper pad. I chalked the edges of the flowers and card with some Tahiti and Java PowderPuff Chalking Ink. Now to finish it off, I just couldn't resist playing with the new Coconut White PowderPuff Chalking Ink, which I tell you is my new favorite ink! I know I said Mocha Mama was my favorite, but now it has some competition. Well.. ok.. I confess.. they are all my favorite! Other Supplies: Technique Tuesday "In stitches" stamps. Thanks so much for stopping by. I love reading your comments and I appreciate your scrappy support! Have a wonderfully happy scrappy day! Adorable card! Thanks for the inspiration. This card is so sweet! And the quote is perfect! I just love your card and the sweet quote works perfectly!